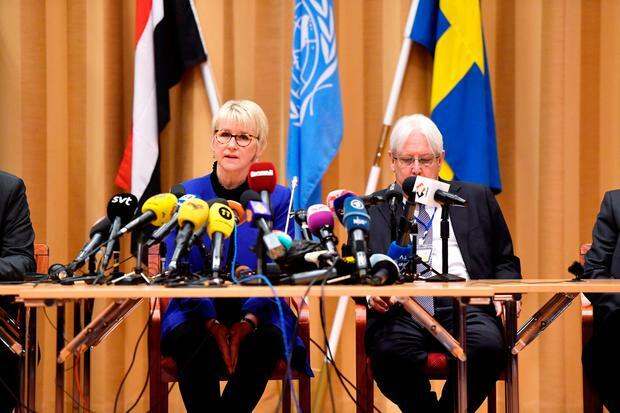 Yemen's warring sides agreed to a broad prisoner swap yesterday, sitting down in the same room together for the first time in years at UN-sponsored peace talks in Sweden aimed at halting a catastrophic war that has brought the country to the brink of famine. The three-year-old conflict pits the internationally recognised government, which is backed by a Saudi-led coalition, against Shiite rebels known as Houthis, who took the capital of Sanaa in 2014. The Saudis intervened the following year. UN envoy Martin Griffiths said the two sides have signalled they are serious about de-escalating the fighting through calls they've made in recent weeks, and urged them to work to further reduce the violence in the Arab world's poorest nation, scene of massive civilian suffering. "I'm also pleased to announce the signing of an agreement on the exchange of prisoners, detainees, the missing, the forcibly detained and individuals placed under house arrest," Mr Griffiths said.